This is a custom built cable assembly, made by WORLDS BEST CABLES (WBC). 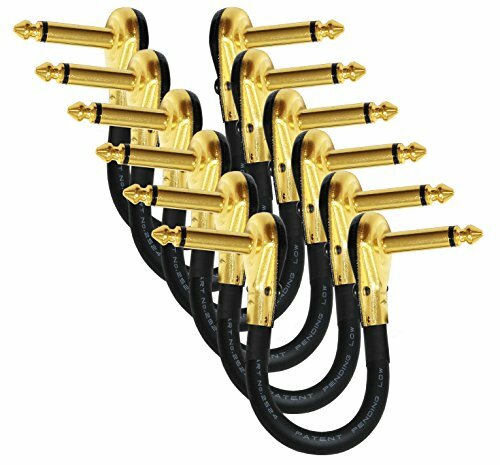 This cable assembly is made using the Mogami 2524 wire and Eminence Premium Gold Plated 1/4 Inch right-angled, low profile Pancake type Connectors. We at WBC always make world-class custom-built cable assemblies using many of the leading cable and connector brands, if you are unable to find the length and type of cable you are looking for, please feel free to contact us, we will strive to assemble the required cable for you. IMPORTANT, PLEASE NOTE: The cable length is measured from TIP to TIP of each connector, this is the industry standard for measuring patch cables (the measurement details are clearly depicted in one of the images in the image gallery to further clarify the measurement process. There are many images in the gallery, please click on the main image to open the full gallery). Please also check out the connector dimensions as some connectors might be too wide for jacks that are spaced close together.